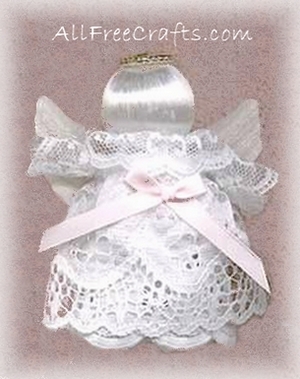 This is an alternate version of our Film Canister Angel Ornament, so you can choose which little lacy angel you prefer to make. Each one is made from a recycled film canister and some scraps of lace. Remove the lid from your film canister and set aside. Glue satin ball bottom to the bottom center of film canister. Measure around the film canister and cut two strips of 2 1/2 inch wide lace that equals your measure and one strip of 1 inch lace to the same measure. Glue the first 2 1/2 inch strip of lace to the bottom edge of the canister, not attaching to the satin ball, but onto the canister bottom edge itself. Glue the second piece of 2-1/2 inch lace to the bottom of the canister, but this time gluing as close as possible to the satin ball without gluing directly onto the satin ball. Glue the 1 inch strip of lace around the neck area and on top of the second piece of wide lace that is already attached. To make the arms, cut a small strip of 1 inch lace, form into a small sleeve and secure the seam with glue. Attach the end of the sleeve piece directly to the dress area of the angel, referring to the photo for placement. Repeat for the second arm. Glue angel wings to the back of the angel, add a decorative ribbon bow to the front and string a small strip of ribbon through the loop of the ornament to use as a hanger. These make wonderful little gift packages when a little trinket is added to fill the inside of the canister. do you know how to make shoulder pad angels?